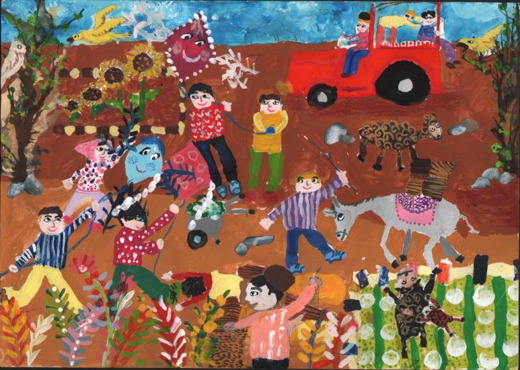 A poster by a 10-year-old Iranian boy secured a berth on the finalists’ list of the 2014 World Food Day Poster Contest. Iranian artist Amir Hossein Mohammadi’s work has entered the finalists’ list of the 2014 World Food Day Poster Contest. The 10-year-old boy’s poster was selected as one of the top 20 finalists in the 9-12 age group. The first prize for the contest went to Zohaib Saqib from Pakistan, and the second and the third prize went to two children from India and Bhutan. The admitted works in the 2014 FAO’s poster contest were required to focus on “Family Farming: Feeding the world, caring for the earth”. The Food and Agriculture Organization of the United Nations (FAO) celebrates World Food Day each year on October 16 which marks the anniversary of the agency in 1945. FAO’s poster contest is annually held for children and teenagers in various age groups of 5-8, 9-12 and 13-17. A gallery of the 60 finalists’ posters will be showcased at the FAO headquarters in Rome, Italy.